The key to the success of this EVP project was really getting to grips with the needs of two distinct businesses (Kuoni Group’s Global Travel Distribution (GTD) and Global Travel Services (GTS) divisions) operating in culturally different landscapes, in a rapidly changing industry. We worked closely with our client to develop a compelling global EVP with a clear, actionable, five-year implementation plan. Kuoni GTD and GTS wanted to create a global Employee Value Proposition (EVP) to focus, first and foremost, on improving employee engagement. They wanted a consistent global approach to engagement, built on sound knowledge of what really makes a difference to people in the overall experience of working for those divisions. They also wanted to establish a set of standards and leadership behaviours to guide their managers to deliver this employee experience. Secondly, they wanted to improve their employer brand to help attract and retain key skills in their competitive markets, with an aim over time to significantly leverage their brand’s USPs, as an employer, to reduce cost of hire. Establishing an EVP was seen to be an inclusive, engaging and commercial approach, creating a clarity of focus and transparency around the ‘deal’ between the employee and the organisation, which can be monitored and measured and which has the potential to enable the step change in the engagement they were seeking. We wanted to quickly get to grips with the motivations for both sides of the ‘deal’. 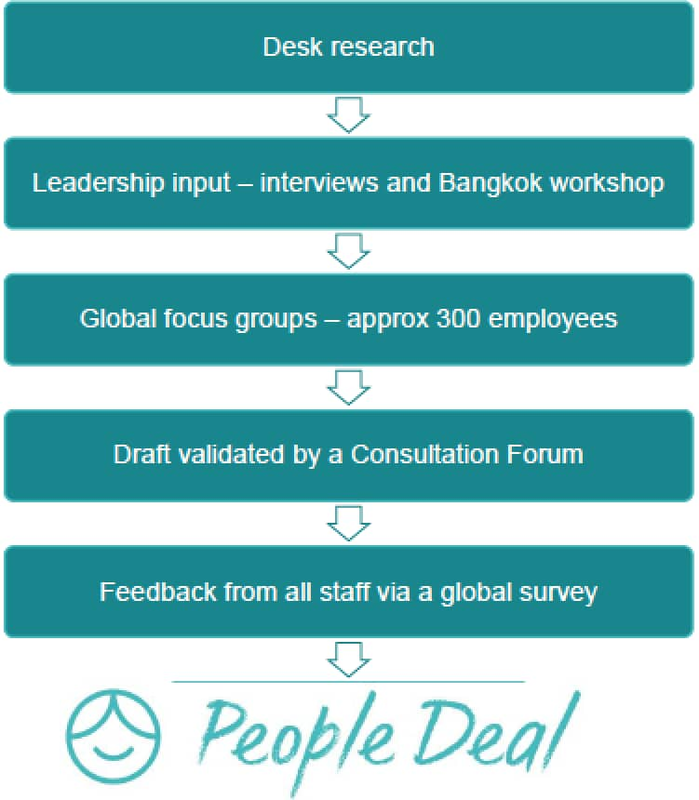 We were lucky enough to be able to take advantage of the top 75 Senior Managers Conference in Bangkok, where we started the buy-in process for the People Deal (what Kuoni GTD and GTS called their EVP). We gathered insights on what managers needed more of from their employees and what they themselves needed from the business to stay engaged and motivated ie. both sides of the deal. We interviewed the Executive team to understand what they thought employees needed, to better help support the business strategy over the coming years. Using their comprehensive Employee Opinion Survey data and other local insights, and using our extensive knowledge of what motivates people in the workplace, we were able to put together a draft EVP at this early stage. We flex our methodology depending on the clients starting point and what process will work best for their people. Our aim is always to create the most effective process. For this project the main aim was to improve engagement and really understand where cultural differences were significant in terms of what was truly driving engagement. We knew the best way to achieve this was to start the engagement process immediately and meet with employees face-to-face. We travelled to key employee hubs to run focus groups in nine locations globally, including Australia, China, Japan, Indonesia, Dubai, US and Europe. We tested the draft EVP in these focus groups to see which elements were most important to people, what was missing, whether the language translated well in all countries, and how ‘real’ (actionable now versus aspirational) was it. We used a solutions-focused approach to understand which things would make a real impact on engagement. The result enabled us to simplify the EVP to five key themes. These five themes we tested in a global-wide, all-inclusive employee survey so we could make final tweaks and make sure that overall the suggested People Deal was more real than aspiration, in this case we were looking for 70% real and 30% aspiration. The testing also told us which elements of the EVP appealed more to each segment of the workforce and therefore which messages to highlight to these groups. The People Deal has created a global community with a shared purpose. The online People Deal website (see screenshots below), created for the launch, shares the actions people are taking around the world to make it more of a reality day-by-day.